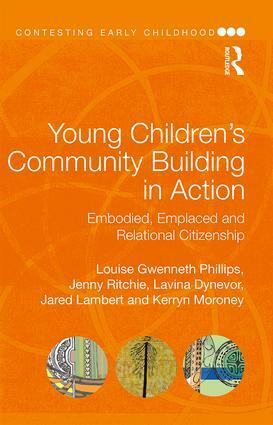 Rethinking the concepts of citizenship and community in relation to young children, this groundbreaking text examines the ways in which indigenous understandings and practices applied in early childhood settings in Australia and New Zealand encourage young children to demonstrate their care and concern for others and so, in turn, perceive themselves as part of a larger community. Young Children’s Community Building in Action acknowledges global variations in the meanings of early childhood education, of citizenship and community building, and challenges widespread invisibility and disregard of Indigenous communities. Through close observation and examination of early years settings in Australia and New Zealand, chapters demonstrate how practices guided by Aboriginal and Māori values support and nurture children’s personal and social development as individuals, and as citizens in a wider community. Exploring what young children’s citizenship learning and action looks like in practice, and how this may vary within and across communities, the book provides a powerful account of effective pedagogical approaches which have been long excluded from mainstream dialogues. Written for researchers and students of early childhood education and care, this book provides insight into what citizenship can be for young children, and how Indigenous cultural values shape ways of knowing, being, doing and relating. Louise Gwenneth Phillips is an early childhood and arts education academic at the School of Education, The University of Queensland, Australia. Jenny Ritchie is an Associate Professor in Te Puna Akopai, the School of Education, at Te Whare Wananga o te Upoko o te Ika a Maui, Victoria University of Wellington, New Zealand. Lavina Dynevor is a proud Wakka Wakka woman and passionate Aboriginal early childhood educator and mentor in Australia. Jared Lambert is Head Teacher at Pukerua Bay Kindergarten, He Whanau Manaaki o Tararua, Wellington, New Zealand. Kerryn Moroney is a proud Luritja woman who promotes equitable early childhood education systems in Australia.